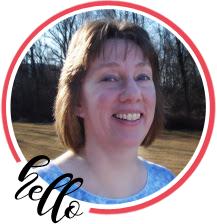 If you arrived here from Judy’s awesome blog, you are on the right track. If not, why not head back to the RRR Blog and start from the beginning so you don’t miss any of the terrific projects. 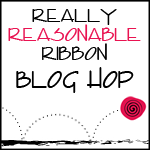 This month the Really Reasonable Ribbon Monthly Ribbon Club Assortment celebrates Christmas. I just love all the reds and greens and the pretty white crochet lace. Isn’t it beautiful??! First I have a Christmas card for you featuring a quick and easy Ribbon Poinsettia Flower. I used the red checkerboard satin for the poinsettia and the forest green diamond satin for the leaves, both found in the October Monthly Ribbon Club assortment. I finished it off with a Snow White Pearl in the center. The flower is sitting on the Christmas Zig Zag on Red Satin layered on top of the beautiful white crochet lace. Looks kind of pretty, right? Would you like to know how I made it? Yes?? Well, okay. I’ll tell ya. First you will need to cut 4 red pieces of ribbon at 2-1/4″ each, 3 red pieces at 1 3/4″ each and one green piece at 2-1/2″. The ribbon width I used is 5/8″ wide. If you increase the ribbon width you will need to increase the length of your pieces. Cut the end of each piece in a point like the pieces below. Seal the ends of your ribbon with fray check or by quickly running a flame across the raw edges. Do you need to seal the ends if you are using the flower on a card as I did above? Probably not. If you are making a hair accessory or something that will be handled quite a bit, then I would go ahead and take the time to seal the ends. Thread your needle with thread that matches the color of your ribbon. For my example I used white so you can see my stitches, but use a matching thread on your flower. Take a few stitches similar to the ones I did below across the middle of the ribbon piece. If you keep your stitching consistent, the pleats of your flowers will be consistent and will make for a nicer finished piece. Stitch all of the 2-1/4″ pieces as shown below. Once they are all stitched, pull the stitching tight and then wrap the thead around the middle. Then tie it off securely and clip the thread. Repeat the same thing for the three shorter pieces and then for the leaf piece. When you do the leaf piece, leave yourself a bit of a tail on the beginning end before your knot and don’t clip the tail when you are done. Stack all your clusters on top on one another beginning with the leaf on the bottom and then wrap the thread from the leaf around all three clusters a couple of times to secure and then tie it off on the back. Clip the thread leaving a bit of a tale that you can catch in your glue or adhesive when you attach it to your project. This will ensure that it won’t come apart. Once the pieces are together you will have to play around with the placement of the petals a bit. It doen’t have to be perfect because how many perfect poinsettia flowers have you seen? Nature is NOT perfect so your flower petals don’t need to be either. Add a little half pearl or button or your choice of embellishment to finish off the center and you are done. Super easy, right?? If you missed the tutorial on how to make a woven ribbon headband, you can find it HERE. Your next stop is Heidi’s wonderful blog. If you liked this project, please sign on as a follower or for my email feed. I haven’t been blogging much lately, but that is going to change really soon. I have some fun projects and tutorials coming soon!! Beautiful! Love the use of the ribbon. OH! Bonnie your flowers are stunning! I just emailed my buddies on my Yahoo card groups and gave them the link so they could come see too. Love your Christmas ribbons. I hope I win! Incredible Bonnie! Thanks for the fabulous tutorial – very clear and concise. Thanks! Wow, thanks for the fabulous tutorial, I am so going to try that one out! Love this! It has (for me) all the elements I like in acard and the poinsettia is beautiful! thanks for the tutorials too! Beautiful card and headband! Love that gorgeous poinsettia you created! Thanks for showing us how! Bonnie you are the queen of ribbon beauties!!! thanks for the deets on both of these lovely seasonal items, i need to try these out!!! great pattern on both the red and green ribbon. What a beautiful card. I'm going to have to try and make one of those poinsettias myself. Lovely card. You did such a fantastic job with the pointsetta. WoW! the poinsettia is beautiful! Loved the traditional Christmas colors and the sentiment. Also like the decorative circle behind the sentiment. OH I love that poinsettia! I am going to try that! Thanks!!!! Thank you for the flower tutorial! Love the card!! Thanks for sharing. I don't usually leave a comment on projects — But your tutorial was so well done — I had to let you know !! Excellent pictures and instructions … Very good job !! Beautiful card. What a great poinsettia. I definately have to try this one.